The Higher Diploma in Cloud Computing is a graduate conversion programme. Cork Institute of Technology offers this unique and innovative graduate conversion programme which is designed to address the skills shortage in the ICT industry. 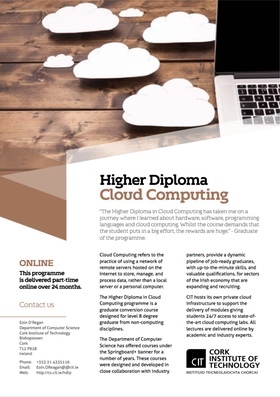 The Higher Diploma in Cloud Computing provides graduates from other disciplines with the opportunity to study the key principles and technologies that support the deployment of cloud computing. This part-time fully online programme is delivered over 4 semesters (two years). Click this link or the image over to download the programme flyer which contains links to all programme modules. AM I ELIGIBLE TO APPLY FOR THIS ICT SKILLS CONVERSION COURSE? If you currently hold a Level 8 degree you are eligible to apply if you are employed. If you are unemployed and in receipt of a jobseekers payment (including Farm Assist and Qualified Adults of Working Age) you are not eligible for the two year ICT Conversion courses. However, if you are in receipt of other social protection payments, e.g. One Parent Family or Disability Allowance, you may be eligible for this part-time conversion course. This programme will be delivered fully online. Lectures are delivered using Adobe Connect and labs are available 24/7 using CIT’s world-class private cloud environment. All examinations will be held on campus in January and May each year. This intensive programme prepares students for work using the following modules, Object Oriented Programming, Requirements Engineering, Network Systems, Principles of Operating Systems, Data Management Systems, Server-Side Web Development, Cloud Architectures, Cloud Computing Infrastructures, Cloud Computing with Python and a final 10 credit project. Please click here or the programme schedule button for full module details. The closing date for processing applications will be when all places have been allocated. As this programme is likely to fill quickly we anticipate a closing date within the next couple of weeks.